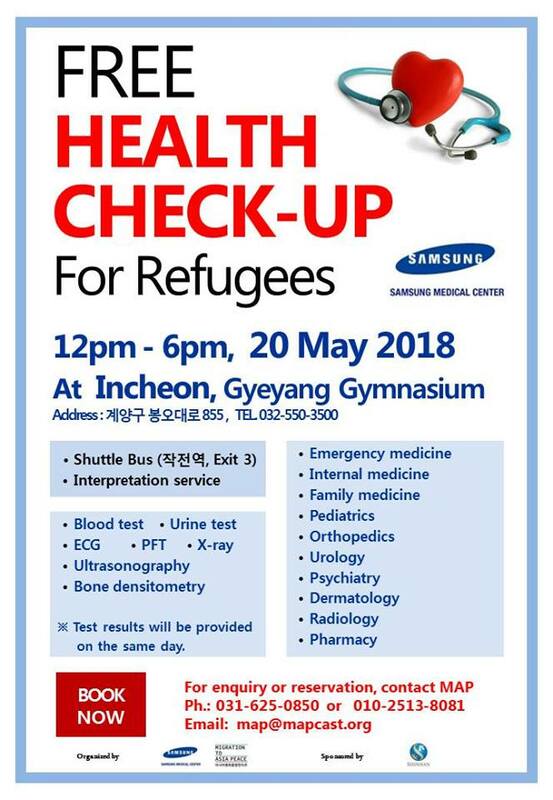 Migration to Asia Peace and Samsung Medical Centre are going to provide free health check-ups for asylum seekers, those with asylum status, and those with “humanitarian stay” status. Interpreting services and a shuttle bus to and from the testing centre will be provided. The check-up’s results and referrals will be issued. Snacks and drinks will be provided following the check-up. 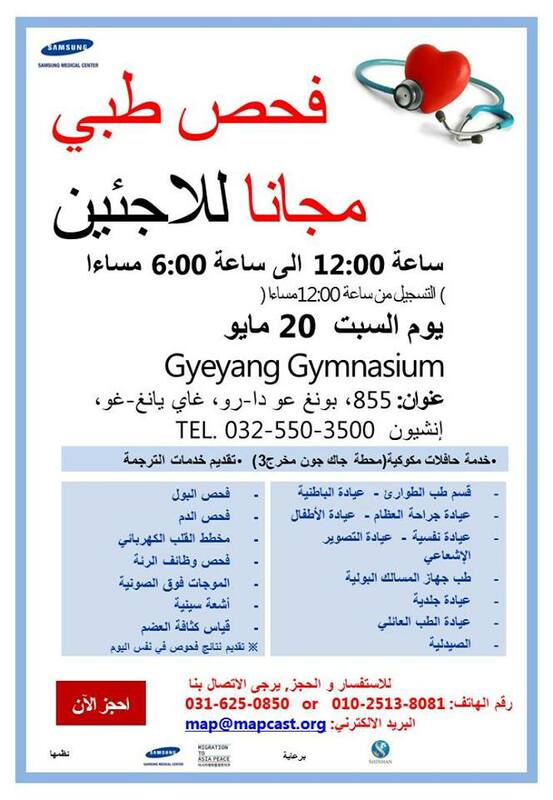 The event is organised by Samsung Medical Centre & Migration to Asia Peace (MAP), and sponsored by Shinhan Bank. But Who Is a Refugee? “Humanitarian stay” visas (G-1) were created to grant stay to those who do not fall under the refugee status as defined by the United Nations (being able to prove that you personally are persecuted by the state, regardless of the the state of your country). In 2015, South Korea had twice as many G-1 visa holders than F-2 visas (residency) granted to refugees. Similar problems persists to immigrant workers, as labour laws remain lax and seasonal migrant workers are often under-reported and unregistered by their employers to the National Health Insurance policy. Migrant workers have limited access to public health care and administrative assistance due to the language barrier as well as unfair and even abusive employers – as few as half of all immigrant workers are estimated to register in the NHI scheme (in Korean only), and often have no government agency to turn to if their employer will not cover their health care costs (including accidents at the workplace). Despite laws stipulating that migrant workers must be registered in the NHI system, the problems remains that the employer must agree to paying monthly insurance fees (in Korean only). Organisations such as Jubilee Medical have been providing free medical check-ups to immigrant workers for this exact reason. 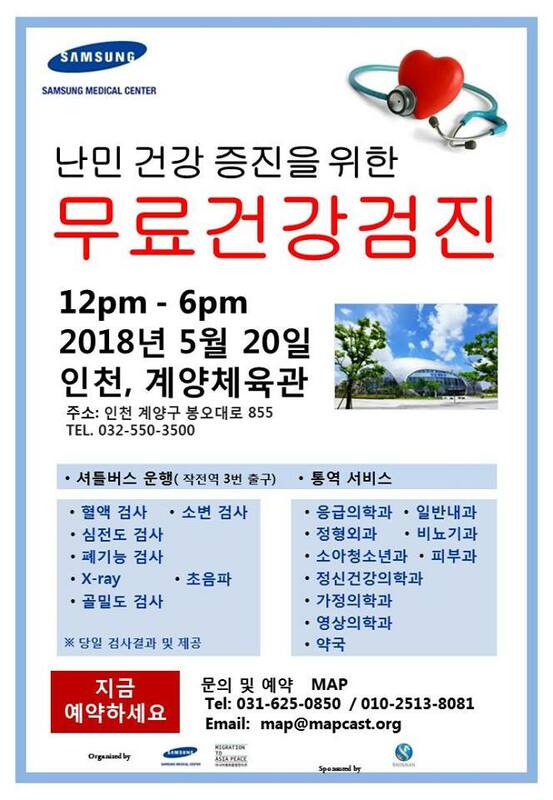 Jubilee Medical, a Christian foundation, was founded in 1995 as a cooperative medical insurance scheme, and currently runs free medical check-ups as well as offers an affordable cooperative insurance (monthly fees at 8,000 KRW/6.3 EUR/7.5 USD, at a 50% coverage rate; accepted at a limited number of hospitals). Being a private insurance, Jubilee Medical requires the members to pay up front, and to have the fees refunded to their bank account once the receipts have been submitted. 13 Sept 2015. Yonhap News. Ministry of Employment and Labor.